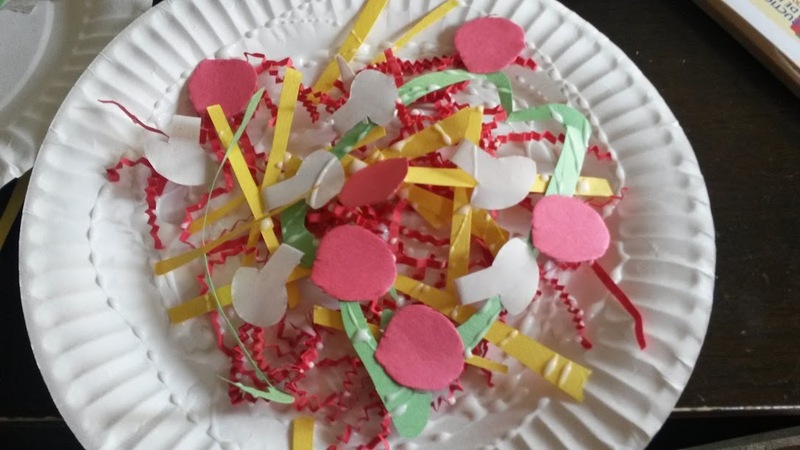 My kids love to eat, they love to play with pretend food and they love to craft. Hmmm. I wonder where they get this from? I love to eat, pretend to eat play food and I love to craft. These are my kind of kids! "Mom, are you making lunch?" "Mom, are you making dinner?" "Mom, can we make a craft?" Miss Thang always offers her 2 cents with "Eat Mom?" "Craft Mom?" A few weeks ago I had a package with the cute little crinkly pieces of paper inside it, like the stuff you fill a gift bag with. I was just about to toss it in the trash when inspiration hit. This would be the perfect base for a craft my kids would want to gobble up! 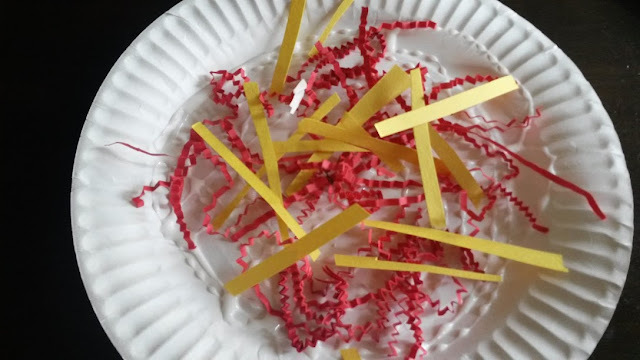 To start off, I grabbed yellow, white, green and red paper that was left over from another craft we made, I cut simple strips of yellow for cheese. Simple circles for pepperoni, I made little curved green peppers and the hardest shapes was the white mushrooms. I cut out quite a few of each. I knew the kids were going to LOVE this craft and I want to be able to repeat it again this winter. The extras I placed in baggies and stashed away for later. 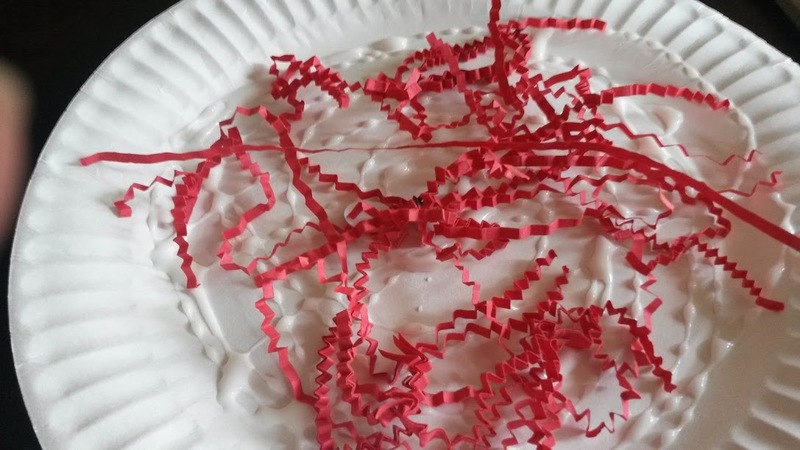 I offered the kids some of each topping, including those crinkly little strips of red paper. They each got a paper plate. To begin we generously applied glue to the plate, then we added our sauce. Then we started to add our toppings. This was a ton of fun for everyone, including me. The works! See how cute my mushrooms are! And there you have it! We made fun pizzas from recycled materials. 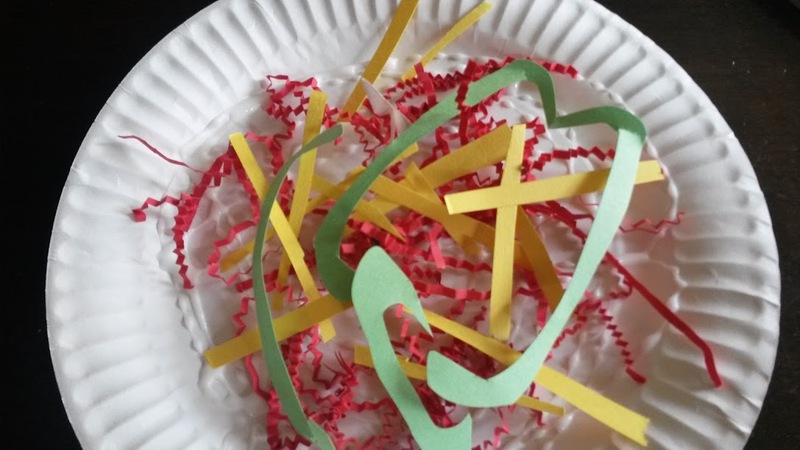 This was really a simple craft that both the almost 2 year old and the 5 year old enjoyed. You will have to stay tuned as this idea has spawned other pretend food crafts!